On a broad reach, extended, you can keep your genoa full even though part of it is blanketed by your mainsail (see pic below). On a beam or close reach, collapsed, as a reaching strut. Improve the genoa’s shape by holding the clew further outboard. You may have to find another location, behind the mast or on the cabin roof, to attach the inboard end of the pole. As a spinnaker pole in collapsed mode. Use a boom preventer or boom brake when sailing wing-on-wing to secure your boom and avoid an accidental gybe. Watch the weather behind you. On a run, weather changes are coming from astern, be alert, be prepared, take down your pole and sails as necessary before extreme winds hit. Watch the clearance between your whisker pole and your shrouds. As your angle of sail moves forward from a run, you will be pulling in your genoa which brings your pole closer to your shrouds. Turning up into the wind will cause your genoa to be backwinded and your pole pushed into the shrouds. Your pole will not work well if it is wrapped around your shroud. Don’t sail by the lee unless there’s no alternative, it’s for a short period of time, the helmsman is at high alert, and you have a boom preventer or brake. On large boats or when used as a spinnaker pole, watch for excessive flexing of your whisker pole. Collapsing the pole makes it much stronger. 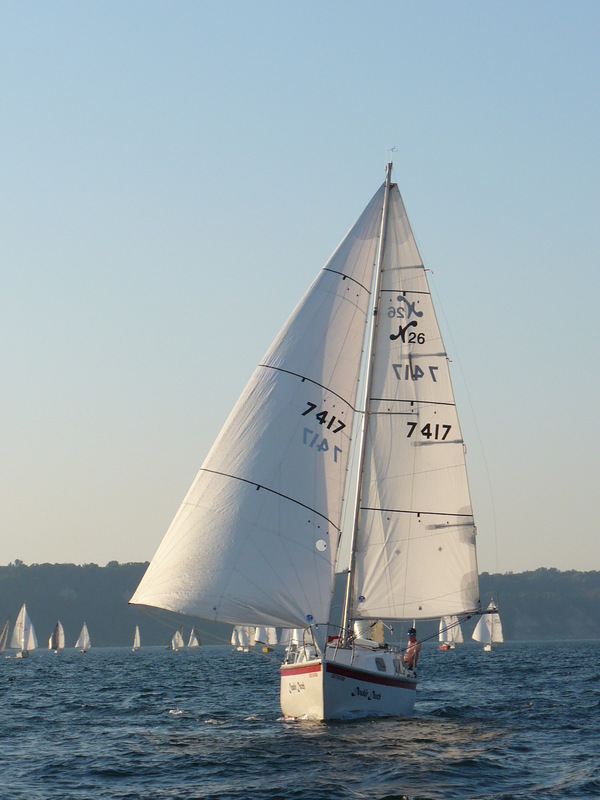 Spinnakers are much larger and therefore impose much more stress on your pole. When mounting and removing the whisker pole, watch where you stand to ensure that a gust of wind cannot push the pole into you. 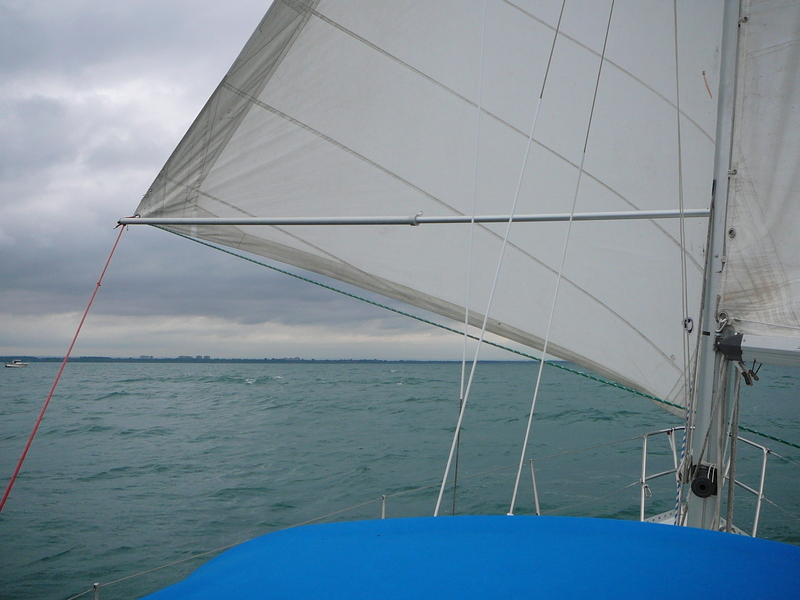 Attaching outboard end to a furled genoa sheet is wise in heavy winds. Clew mount – snap the outboard end directly on to the clew of the genoa. If there isn’t enough space due to your genoa sheets, then you can make a small loop of rope that dangles below the genoa onto which you attach the pole. This is more convenient in light air. Many larger poles are heavy and will weigh down your genoa, flattening it out, which is not an optimal shape in light winds. The vast majority of time, you will likely not need a topping lift unless you sheet mount the outboard end on light air days. In times when you do, it can be very simply added by using a spare genoa halyard, wrapped around the pole and clipped onto itself. Do this as far outboard as possible to minimize the lateral stress on the pole. If you secure both ends of the pole and pull up on a mid-mounted topping lift, you can damage and even break the pole. A fully outboard attachment of the topping lift is optimal but often not convenient. 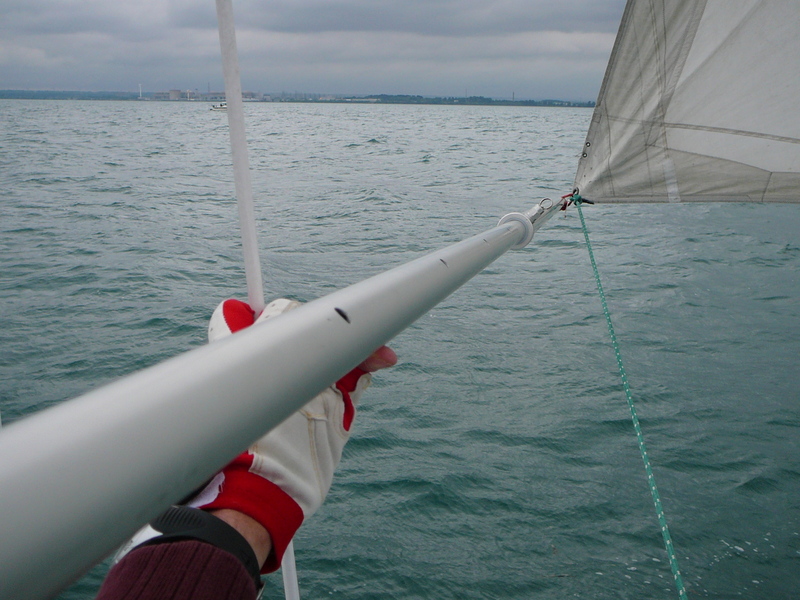 A downhaul, typically used on spinnaker poles to prevent them from lifting up during a wind gust, is typically not needed for whisker poles. If you want to attach one, do so at the extreme outboard end of the pole. Do not mount on the aluminum pole. This pole is designed for compression forces, not the lateral sheer force which would be caused by holding down anything but the end. A 3-point securing methodology is highly recommended in these situations. Attach 3 lines to the outboard end of your pole, a topping lift and 2 downhauls. The downhauls should be attached to deck fittings, one forward of the pole, and one aft. Between these 3 lines, the pole is held very securely in place. Be sure to sheet mount the genoa. With this configuration, your pole and genoa are much more secure. 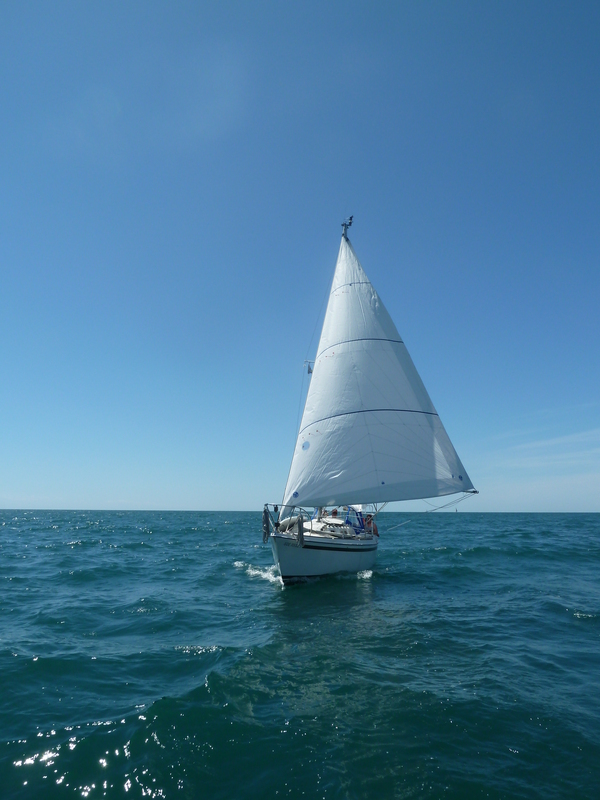 You can also furl your genoa fully without touching the pole. In rough weather, cruisers should consider furling the genoa before sheet mounting the outboard end, it will be much easier.